Surprisingly, the Italian Terraces in front of the Crystal Palace, which burnt down in 1936 after its relocation here, are still largely intact. From their vantage point at the top of the rise, these Grade 2 listed structures overlook a grassy area, with a wide "Grand Central Walk" leading down to a monument to Paxton, the new National Sports Centre, and the Crystal Palace Park itself. The terraces consist of an upper and a lower terrace, linked by flights of steps. 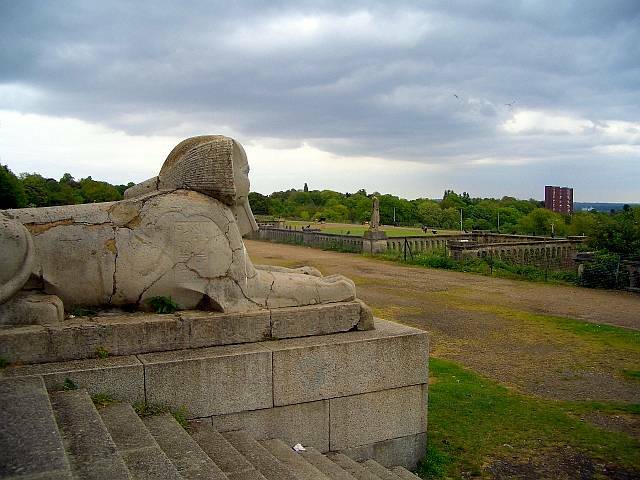 The sphinxes flanking each flight, several of which survive in reasonable condition, are said to have been copied from a sphinx in the Louvre (see "Crystal Palace Park"). They seem to have been constructed with an aggregate shell, which is now cracking. Even so, details can still be seen on their surfaces. These include cartouches, demonstrating the general interest in the Egyptians at this time, and the particular interest of the architect/designer Owen Jones, who had been responsible for the interior design of the Great Exhibition, and was appointed director of decorations for the Crystal Palace in this location. Along the balustrade of the lower terrace stand three of the original row of statues representing the different parts of empire. One is just the lower part of a figure and another is a female figure in robes, without a head; but the third, which stands next to the impressively wide main steps, has been described as a "reasonably complete male figure, standing, robed, with a turban, beard and cloak thrown back over his shoulders and hands clasped in front of him" ("Row of Statues along Terrace"). This one's robes, like the eyes of a sphinx at the end of the terraces nearest the Crystal Palace Museum, retain some (presumably) original colouring. This figure might be a representation of India: compare it, for example, with the ceramic Indian head attributed to Walter Crane. Also intact is the colonnaded retaining wall of the lower terrace, and the central flight of steps, which both give some impression of how large and spectacular the palace must have been. A few other reminders of the past are dotted around the grounds, such as another headless statue, thought to be that of Dante. The scene is very atmospheric, but the only building to have survived the devastating fire was the architecturally undistinguished Crystal Palace School of Engineering, established in 1872 near the South Terrace Gates. This now houses the museum. Not far below it, the Crystal Palace Station, opened in 1854, also escaped the blaze. Steps leading from the terrace to the "Grand Central Walk"
"Crystal Palace Park, Penge, South London." Viewed 8 May 2009. "Row of Statues along the Terrace" (Public Monuments and Sculptures Association site.) Viewed 8 May 2009.